1. A core, or nucleus, of protons and neutrons that are surrounded by an orbiting cloud of electrons: The chemical behavior of an atom is largely determined by the distribution of its electrons, particularly the number that exist in its outermost level. Carbon, the sixth element of the periodic table of atoms, forms the basis of most biological molecules and oxygen is another atom, one of about a hundred basic elements that make up all of the objects around us. 2. The fundament building blocks for all matter: An atom is the smallest representative sample of a chemical element and it consists of a positively charged nucleus surrounded by negatively charged electrons. All of the matter on the Earth is made of atoms which are the chemical structures of our world. New modern atomic theory is generally credited to an English meteorologist, John Dalton (1766-1844), who suggested that for each chemical element there was a corresponding species of indivisible objects called atoms. Two or more atoms that are joined together form a molecule which is the same term that applies to any cluster of atoms which can be isolated, whether it contains two atoms or a thousand atoms. 3. A tiny particle or a very small amount of anything: After the politician's presentation, Nicola was heard to say that there was not an atom of truth in anything that he had said. 4. Etymology: atom means "not cut, indivisible"; from Greek atomos, "uncut, indivisible"; from a-, "not" + tomos, "a cutting"; from temnein, "to cut". 1. A reference to being based on or involving nuclear reactions: Some atomic references include, atomic reactor (device in which a chain reaction is initiated and controlled, with the resulting heat typically used for power generation and the neutrons and fission products used for military, experimental, and medical purposes) and atomic waste (material containing the unusable radioactive byproducts of the scientific, military, and industrial applications of nuclear energy); plus many other applicable terms. 2. Pertaining to or related to the smallest particle of an element that can exist: Here are some significant atomic terms which are related to atoms. Element, a chemical substance that can't be broken down; including solids, liquids, and gases. Atom, the smallest particle that keeps its chemical identity. Molecule, any collection of two or more atoms that are bound together. Electron, an atomic particle that has only a small fraction of the mass of protons and neutrons of the atom. Nucleus, the small, massive central part of an atom made from positively charged protons and electrically neutral neutrons. Proton, a positively charged nuclear particle consisting of individual electromagnetic waves. Neutron, an electrically neutral nuclear particle. Ion, an electrically charged atom. A lack of physiological firmness of tissues and normal functions of bodily organs: The atonia of Olivia's body was a result of a poor diet and a lack of exercise that caused various muscular disorders; such as, spasms and temporary rigidity of her muscles. Something that is caused by, or exhibits a lack of normal muscle tone or strength: Wilber's atonicity can result in a loss of tension or strength in a muscle, so that it is completely flaccid or floppy. Some atonicities take place because of a nervous system disorder or after an injury to the nerves: The arm muscles may have atonicity resulting from damage to the "brachial plexus" or nerve roots in the neck that go into the arms. Characteristic of not being poisonous nor harmful to people, animals, or the environment: Rory, the farmer, made sure that he was using ataxic fertilizers in his fields so no living creatures would be harmed. 1. Referring to anything that is not inflicting or causing damage or injury: Doctors try to use atraumatic therapies or therapeutic instruments and devices that are unlikely to cause tissue or other physical damage to patients. 2. Especially designed or planned to minimize injurious effects: Dr. Hall used atraumatic sutures during the surgery. Congenital (at birth) absence or loss of hair: Ever since Theodore was born 60 years ago, he has always had a head that was atrichosis. A reference to the absence of hair either congenital (from birth) or acquired during life: There are some men who prefer to have atrichous heads instead of having hair to take care of. The wasting away of tissues, organs, or the entire body: Whenever a person has atrophia, this condition can be traced to a disease or because of a lack of exercise; both of which cause weakness or the wearing away of body tissues and structures. 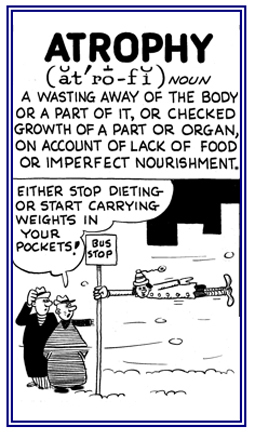 A wasting away; especially, of body tissue, an organ, etc., or the failure of an organ or part of it to grow or develop, as a result of insufficient nutrition or because of a disease: Many people suffer from atrophies of tissues, body organs, or the entire body because of a reduction in the sizes or numbers of their cells. 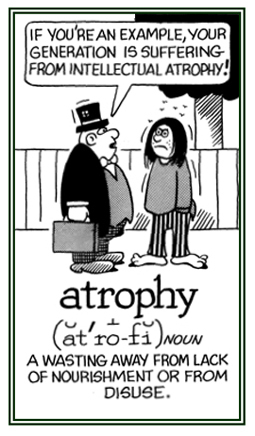 Atrophy is commonly caused by the lack of use; such as when a limb (arm, hand, etc.) has been immobilized in a plaster cast or by inadequate cell nutrition because of poor blood circulation. Physicians are aware that atrophy may also take place during a prolonged serious illness, when the body needs to use up the protein reserves in the muscles. 1. To waste away as a result of the degeneration of body cells: Without adequate exercise, the muscles will atrophy regardless of one's age. Simon significantly atrophied during his bedridden illness. Many elderly people have "sarcopenia", when the muscles are atrophying, because either they don't exercise at all or not adequately. People are never too old to exercise! 2. The degeneration, decline, or decrease, because of the lack of using something: Dr. Hughes, the professor, argued that freedom and independence of thought were progressively atrophying because too many people were simply ignoring their political rights. A descriptive term for that which is not usual or normal: Jane and Roger Kilfoil had an atypically leisurely work day just before the holidays. Showing page 22 out of 23 pages of 340 main-word entries or main-word-entry groups.